Comparative Video 101: On The Shoulders Of A Giant: Milt Okun's New Memoir "Along The Cherry Lane"
On The Shoulders Of A Giant: Milt Okun's New Memoir "Along The Cherry Lane"
Every mature fan of popular folk music and in fact popular music in general probably already knows who Milt Okun is - one of the most influential figures in American pop music history, of the same weight and significance as the likes of Gordon Jenkins and John Hammond and Voyle Gilmore and Quincy Jones. A classical musician by training and a music teacher early in life, Okun spent decades shaping and influencing the careers of artists like Harry Belafonte, Peter, Paul and Mary , the Chad Mitchell Trio, an alum of that group named John Denver, Tom Paxton, Laura Nyro, The Brothers Four, opera superstar Placido Domingo, and many, many more. Okun was a literal jack-of-all-trades for these artists, by turns producing their recordings, arranging their music, influencing their artistic choices and musical directions, and providing them with rehearsal space and a place to lay their weary burdens down in the home he shared with Rosemary, his wife of now more than fifty years. Okun has had a long and colorful career (he is today a hale and active eighty-seven years old) but one that clearly defies easy categorization. Like Hammond and Gilmore, he is a producer par excellence with an innate sense of how to get a recording to sound right for each artist he has worked with; like Jones and Jenkins, he has created complex and beautiful arrangements across a number of musical genres. Okun has also conducted orchestras, recorded his own folk albums, provided creative criticism, suggested material, discovered artists and songs, and shepherded temperamental musicians through some rough spots in their careers. There is not a single term that can encapsulate such a richly complex professional life. 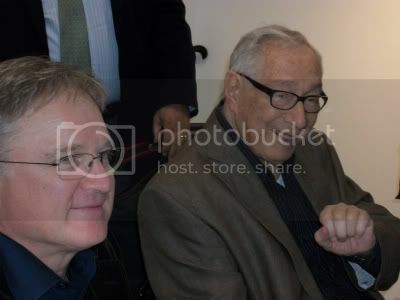 It is a testament to the quality of what Okun (R.in the photo) and co-author (and son-in-law) Richard Sparks (L. - at a book signing in Santa Monica, CA) have accomplished in Along The Cherry Lane, Okun's memoir published this week by Classical Music Today, LLC, that that career emerges in all its aforementioned complexity as the expression of a single, clear passion - Okun's love for music in nearly all of its forms, which in turn has driven him to work unflaggingly to help other musicians, from children in New York City's public schools to major international stars, to realize most completely their own potential as musicians. It is equally to the credit of Okun and Sparks that the liveliness and color of that career do not expire when they reach the pages of a book that cannot present the music itself of which it speaks so clearly and warmly. Much of the credit for that latter point must go to Sparks, who is himself a record producer, lyricist and playwright of note and the author of a number of other books on everything from music to poker. Sparks has chosen to eschew a simple chronological narrative in favor of letting Okun tell his own story in his own way, and most of the book is the record of conversations between Sparks and Okun, with the former pitching questions to the latter. Interpolated at key points are comments from many of the musicians who benefited from Okun's work, and Along The Cherry Lane derives its structure rather more from the creations of the musicians themselves than from a simple autobiography of the subject. It works nicely, not least because Okun's involvement in the careers of the artists usually occurred at a point when they were most in need of musical direction - Peter, Paul and Mary's learning to sing harmonies, for example, or Placido Domingo's decision to attempt a crossover into popular music by recording an album of non-classical songs, most notably his duet with Okun client John Denver on the latter's composition "Perhaps Love." Okun and Sparks also reward the reader with significant insights into the often Byzantine workings of the "music publishing" industry, and nowhere else will you find a more succinct description of what that term means than in this book. Just as Okun speaks most glowingly in Along The Cherry Lane about musicians (Denver and Domingo especially), the con artists of the business side of music who attempt to chisel away at the money earned by the songwriters and performers (or just flat out steal it) come in for his sharpest barbs. Okun is especially critical of the way royalties and licensing of songs have been handled by the major recording companies, which often deprive the artists of significant income due to incompetence, dishonesty, or neglect. Okun speaks most proudly of the way that his own publishing company, Cherry Lane Music (named for an off-Broadway theater near his original office, and quite coincidentally a line from the "Puff, The Magic Dragon" song that Okun helped to arrange) managed to rectify some of those errors, and the consequent loyalty of songwriters like Denver and Paxton to the company as a result. The arrangement is perfect for the skills of the musicians, with voices brought into the mix simply, as on the second verse where a solo vocal blends into duo unison and then flowers into three perfectly integrated parts. It is complex enough to be interesting but simple enough to execute for the self-taught musicians that all three group members were. The mix here is nearly perfect. As fine a singer as Denver was, he could not match Domingo's volume, so Okun chose to have the singers alternate lines for the most part, keeping moments of actual harmony to a minimum and influencing Domingo to moderate his vocals so as not to overwhelm Denver. Once again - it worked, and Okun and Sparks relate the story of how it came to be thoroughly and engagingly. Along The Cherry Lane is a significant and welcome addition to the growing number of books that have tried to deal with the popular folk revival of the late 1950s and early 1960s. Some of those books are pedantic and unfocused; some are scurrilous and gossipy; a few are inspired and highly readable. Okun's and Sparks' effort belongs in that last category, and it is in every way worthy of the career that inspired it. Your review is right on target...very well deserved kudos to Milt & Richard. I have known Milt since the '50's, and am deiighted to see that you have finally set the record straight. For example, I remember well the strange sounds that emanated from Mary's Travers' voice box during rehearsals before Milt taught her to sing! Your review is a wonderful tribute to an extraordinary man....thank you! Remembering Nick Reynolds - "Everybody Sings!"